These days, before buying anything people do their homework by searching the Internet. On top of that statement, consider 4 out of 5 consumers use smartphones to do their shopping? On this blog we highlight some other ways the Matterport technology is being used for nationwide reach with one continuous sweep. *Speaking of sweeping, we should first point out the Matterport 3-D camera takes full 3-D imagery by sweeping a room, recording its floor plan and producing a video format. The video made can be viewed by clients from anywhere, any country and at any time. They get a full tour of a featured property (without the need for goggles) while experiencing it much in the same as 3D imagery found in digital games. The viewers look at a home or building, simply by looking at their mobile device. This is a beneficial reason why so many of the luxury real estate marketers have added Matterport tools to their repertoire. But, what the 3D tour does, it allows you to sell more information about the property without them being present. By utilizing the digital tour, you provide your prospect with in depth information, enticing them to want more. For luxury markets this tool is invaluable because so many of their demographic lives or commute long distance. Now with the ability the client has of touring a property they save time, while making the realtor look like a genius. To top that, this demographic expects their real estate professional to use every component they can to buy or sell their properties, making Matterport an innovative solution. 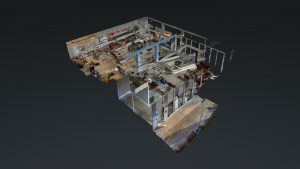 As a leading innovator of this technology, Matterport has been mentioned in numerous articles across the U.S. People utilizing 3D tours are coming from many backgrounds including wholesale manufacturers and more. For example, if the stakeholders of a particular company want to make changes to a building or plant, they can view the property easily with a computer, cell phone or tablet. There’s no need for them to step foot in the facility at all. Real estate advisors, investors and marketing firms are jumping on board as well. There’s also been information found where retail establishments are keeping up with their storefronts by creating visual layouts for their employees to replicate when changes are needed such as holiday displays. Interior designers are finding great use of this tool also. With the mechanics of the device and its simple camera-to-device work flow, a designer in France or Italy can view a room and have measurements added by including a “Mattertag”. These pop-ups allow a more accurate way to get information. This feature can be modified to add any message you’d like. When the viewer hovers over a wall or countertop for instance, they can view a pop-up with additional dialogue that was added. With this system, diversity and the intricate way to view a 360° panoramic video of your real property, there’s a real advantage here for the viewer and the user. These are ideal for many of today’s mobile user experiences and helps you sell the information a client needs in an effort to make a conscious decision. In addition to that thought, do a simple Google search and what you’ll find, is there’s a reach across the ‘Great Divide’ utilizing Matterports 3D touring technology. This innovation is sweeping the nation and is ready for you to jump on board. When you use the company’s applied science, it’s inevitable you’ll be reaching more clients who are doing that homework by way of tablet or cell, so it only makes sense to use it. Learn more about Accutour 3-D touring tools, by contacting us direct.